You know how much I love easy recipes! Right now I am on the hunt for healthy eating options for our family. All of the processed things at the grocery store are so tempting, but we are trying to limit as much as possible and eat more things grown from the ground. 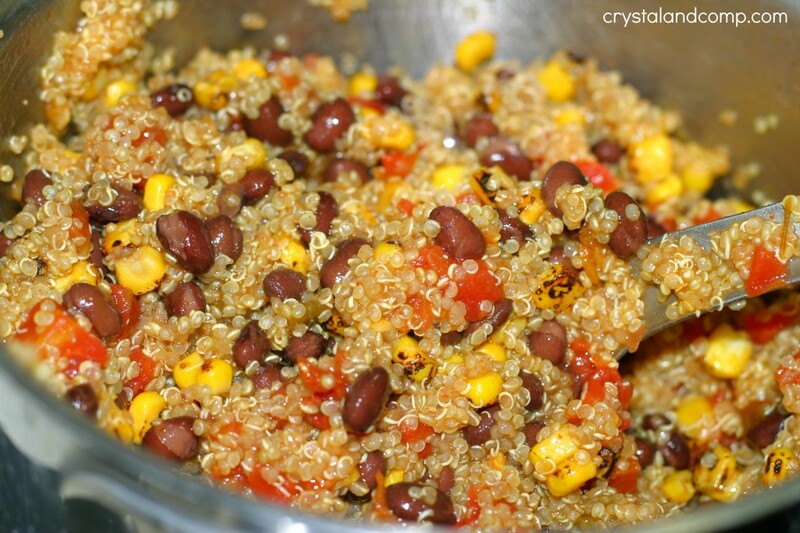 I am becoming a fan of quinoa more and more. There are so many ways you can work it into your meals. 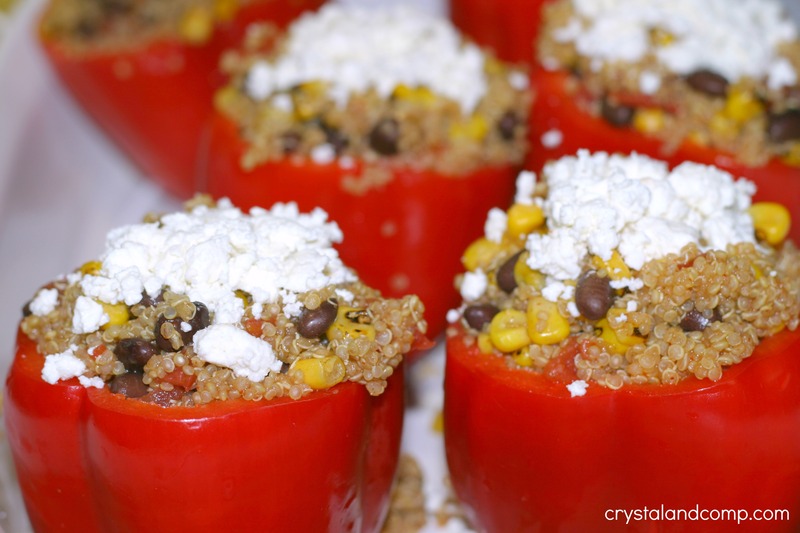 Here is how I used it in a stuffed bell pepper recipe. My husband LOVED these! One child complained…. ok, maybe two. But we got through it. 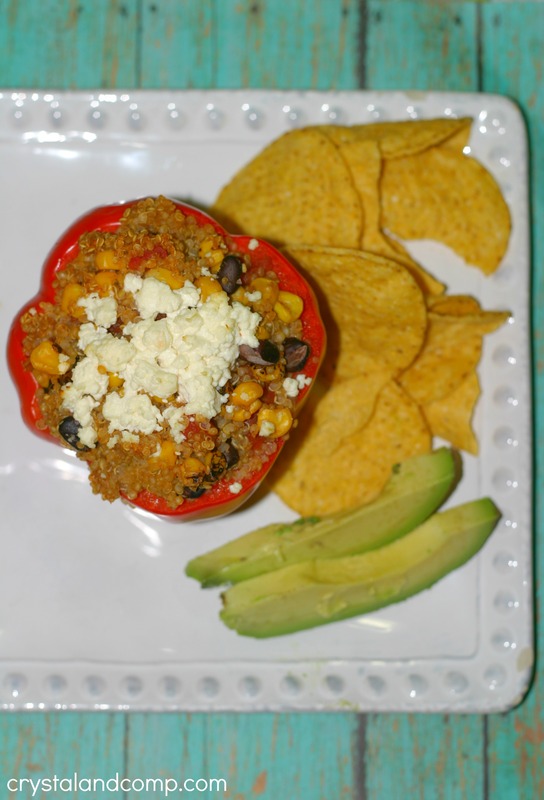 What I love about this is you can easily dump out the quinoa filling and serve it over chips and top with some shredded cheddar cheese and it is more appealing to little ones. Simple modifications are ok, as long as I am not being a short order cook. 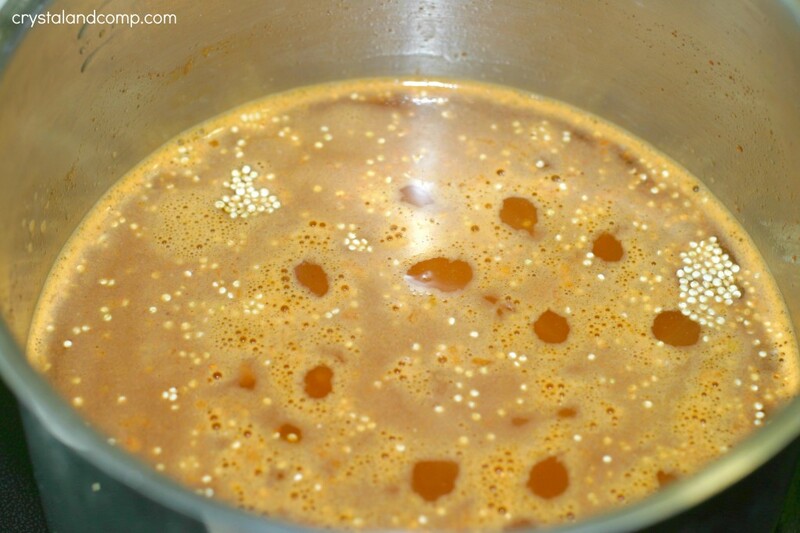 Add the chicken broth and taco seasoning to a pot, Whisk it together until well combine. Pour in the quiona. Add salt and pepper to taste if you want to. I did not. 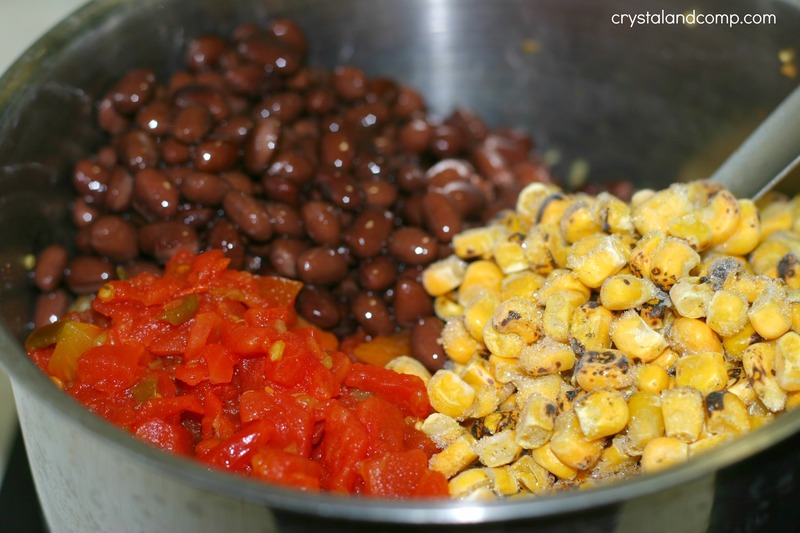 Once it is at a boil stir and then add in the corn, the drained black beans and the dried can on Rotel. Stir and then reduce heat to simmer. Pop the lid on it and let it sit for 10-15 minutes. While you’re waiting on the quinoa to finish wash your bell peppers and cut the tops off so you can remove the stem. Rinse out the inside to remove the seeds in you want. Now, the quinoa should be done. It will look like this. Stuff the bell peppers with the mixture. Place them in a 9×13 pan. Pop them in a 350 degree oven for 25-30 minutes. When they come out of the oven plate them up and serve with chips and avocado slices. So easy. Very healthy. Cooks quick! 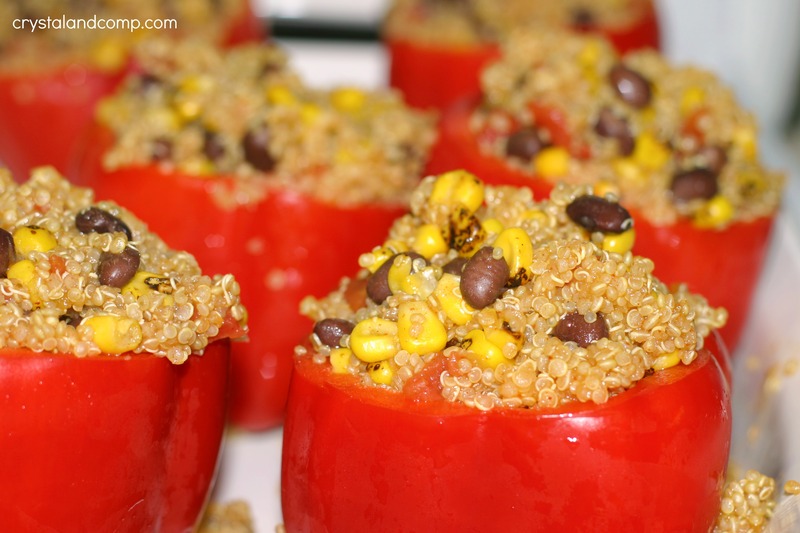 What is your favorite way to cook with quinoa? I love stuffed peppers. 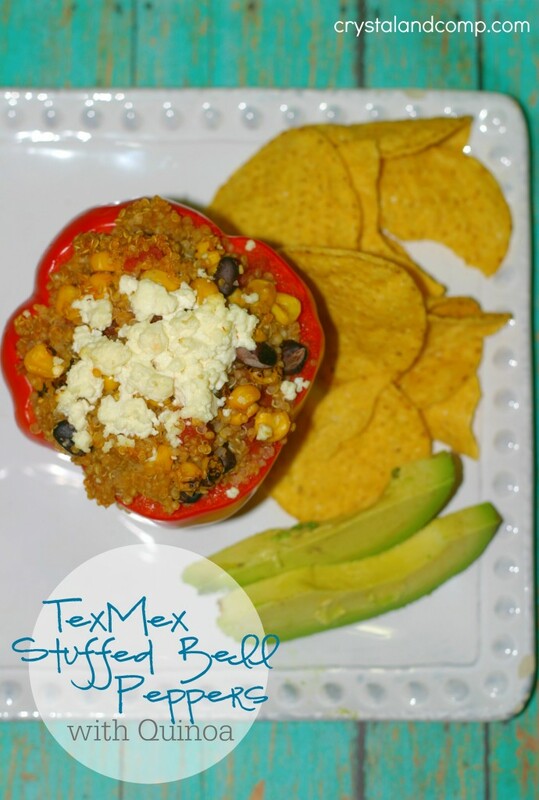 Your recipe with the Tex Mex twist sounds really good, and I can’t wait to try it! My Gram always made them with green peppers, but I am finding out that I really like them made with the orange or red ones! Thanks for sharing! They were awesome. My husband loved them! Mmm this looks tasty!!! Thanks for sharing at Tips and Tricks!